The value of short passes: explained, then illustrated. Last Sunday, the Giants pulled out tactic #5 when they read the Redskins blitz… Eli quickly tossed outside to Mario Manningham who read the correct coverage as well, and Mario quickly worked it out for a first down — and so much more. Not only did he make a huge play off a short pass, he scored his first career NFL Touchdown on what some consider a throwaway play. While I outlined above that these types of plays should be used sparingly, they still work. These types of short passes introduced at the right times frustrate defenses, and for the rest of the game they force your oppostition to question what you’re going to do next. Maybe they can’t bring the pressure from their corners the same way on the next set of downs — and then you can focus on pounding away running the football. It’s about staying ahead of the defense, reading what they are giving you and responding quickly. 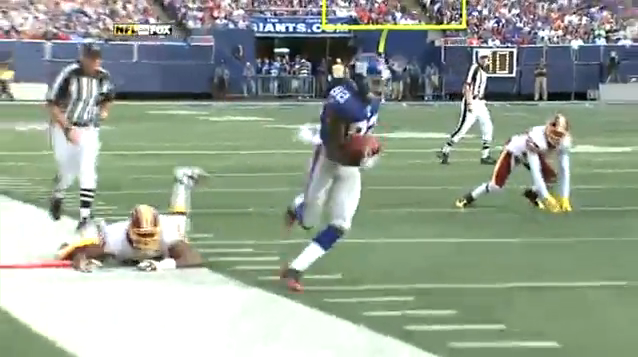 The Giants preparation for this kind of scheme was obvious, and they executed. Introducing these types of short passes into your offensive scheme creates a dynamic set of challenges for any defense, it wears them out, it frustrates them — and they allow you to become a more balanced offense, you score points, and it’s simply working effectively with what the defense is giving you. In this way, Eli Manning is fantastic at managing his games and his team. That’s the reason Eli Manning is successful, his preparation and focus when it comes to improving the Giants offense is second to none. If you didn’t know, he spent some time the past offseason working with Mario Manningham to better understand the Giants Offense in preparation for camp. That’s preparation for preparation people!